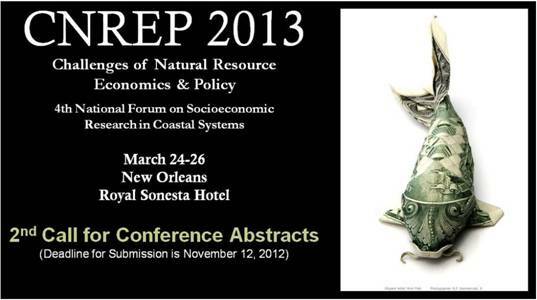 The Center for Natural Resource Economics and Policy (CNREP) is announcing a second call for abstracts for: CNREP 2013: Challenges of Natural Resource Economics & Policy, the 4th National Forum on Socioeconomic Research in Coastal Systems. The conference will be held March 24-26, 2013 in New Orleans, Louisiana. This triennial forum focuses on the opportunities and challenges of socioeconomic research in the development and evaluation of coastal resource restoration and management. Potential session topics include, but are not limited to, market and nonmarket valuation of ecosystem services and coastal resources, environmental benefit-cost analyses, economic linkage/impact assessment, input-output modeling, and comparative assessments of resource management and restoration policy. Basic and applied research, extension-oriented, and policy discussion submissions are all welcome. The deadline for abstract submission is November 12, 2012.